The devil is in the detail, they say. The original version of the phrase was actually “God is in the detail”, so whichever way you look at it, details clearly make a difference. Today’s recipe, for example, would be a simple tomato and onion salad were it not for the capers, mint, and above all lemon zest. But it’s precisely these minor additions that make the salad worth telling you about. Whilst on the subject of details, note the name of this recipe. This is not insalata di tonno (‘tuna salad’), but insalata per tonno (‘salad for tuna’). I’ll explain. I was grilling some tuna steaks and wanted something to go with them. A tomato and onion salad of course is a classic accompaniment to anything rich in flavour and grilled, and onion in particular offsets tuna perfectly. But I wanted something a little more tailor-made, a salad designed specifically for tuna, and so I added two more classic Sicilian accompaniments: mint (often used in cooked tuna dishes in western Sicily) and capers (which crop up in tuna salads in the Aeolian Islands amongst other places). Then, instead of simple lemon juice, I added the zest too, which really cuts through the rich flavoured tuna meat and cleanses the palate. This, as said, is salad for tuna, not tuna salad, although since it is designed to be served with tuna, you could simply mix in some tinned tuna and turn it into a main course salad in its own right. Delicately mix all the ingredients together and serve immediately. 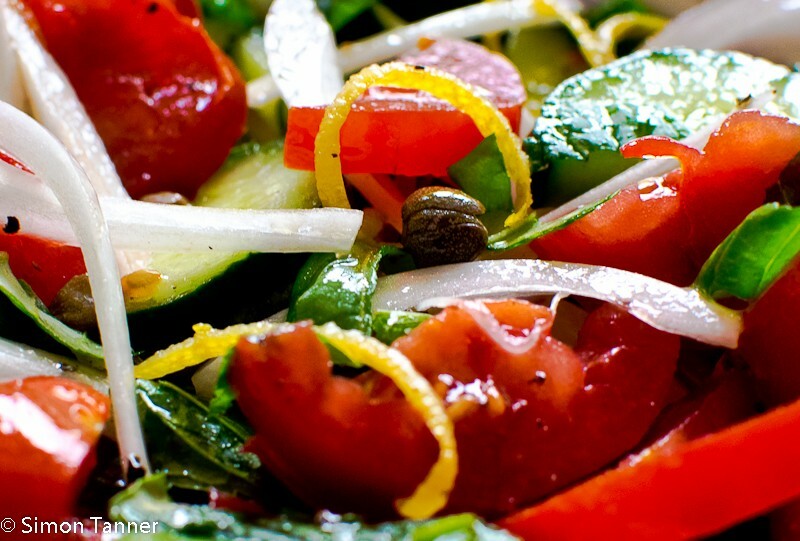 This entry was posted in Fish, Salads, Vegetables & side dishes and tagged capers, capperi, insalata, pomodori, salad, seafood, tomatoes, tonno, tuna by hungryenglishman. Bookmark the permalink. how to made the salad?